Well, the Atlanta region has spoken. The proposed one-cent sales tax hike to support $7.15 billion in spending on transit and roads was roundly defeated Tuesday, with 62 percent opposing. Though approved by Atlanta city voters, none of the 10 counties considering the measure gave it the thumbs up, according to unofficial results. The immediate implications are huge. The most urgent is the funding situation at MARTA, Atlanta’s already threadbare transit system, which sees half a million daily boardings. MARTA will most likely see fare hikes or service reductions in the next fiscal year, said Ashley Robbins, executive director of Citizens for Progressive Transit, which advocated for the spending package. The region’s transit agency, which receives no state support, has been spending down its reserves. Even with the $600 million earmarked for MARTA in the referendum, the agency was still facing a $2.3 billion shortfall over the next 10 years. In addition, the region’s suburban express bus service, GRTA, which serves about 10,000 daily, will most likely be forced to close. And Clayton County, a largely urban county south of Atlanta that lost its transit service altogether two years ago, will have no means to restore service. And Atlanta can forget about expanding rail service in the short term. By state decree, the entire $600 million for MARTA in the package was for capital needs, not operations, according to a MARTA spokesman. The referendum’s failure is a major setback for the Beltline, Atlanta’s innovative plan for a greenways and rail corridor that would circle the central city (though the region’s downtown streetcar project is moving forward with federal funds). Georgia Governor Nathan Deal told the AJC this morning that he had no interest in reviving the transportation spending package in any way, although he had campaigned heavily for its passage. He also rejected the idea of seeking new tax revenue elsewhere. In light of the defeat, Deal said he would focus existing resources toward plans to add an interchange at I-285 and Georgia 400. He said other projects would have to be delayed, and he indicated he was not eager to do anything to shore up MARTA. “MARTA needs to be fixed, and before the taxpayers are going to spend any more money on MARTA, I think they’ve also sent a message that they’re not going to put more money into something they perceive is not functioning appropriately with the revenue that’s available,” he said. With that, it seems the Atlanta region’s fate as one of the most congested cities in the country is sealed. The Georgia Department of Transportation, which ranks 49th nationally in per-capita transportation spending, is mired in debt. Roughly half of Georgia’s existing gas tax revenues must be put toward debt service, said Robbins. Without the revenues that would have come from the sales tax, the state may find itself returning federal funds, for lack of a 20 percent match. “We have no money for roads, no money for trains, no money for anything now,” Robbins said. 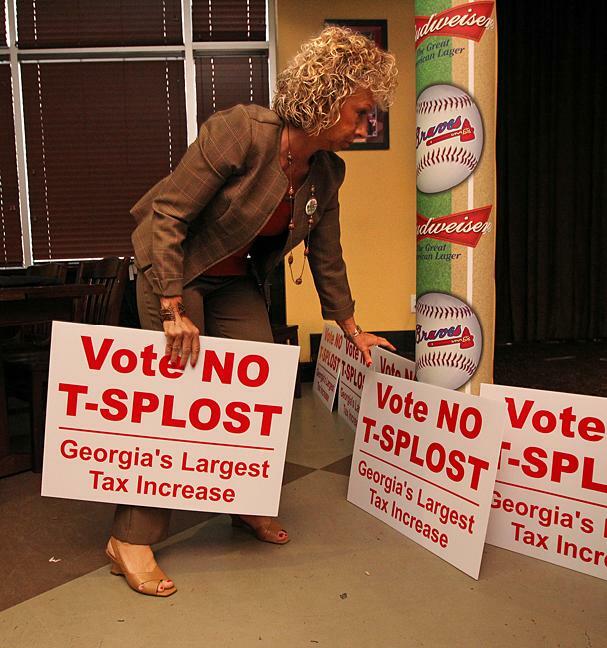 The Atlanta Journal Constitution called election results a “win for the Tea Party” and a “voter revolt,” against a measure that had the enthusiastic support of Atlanta’s business community and political establishment. 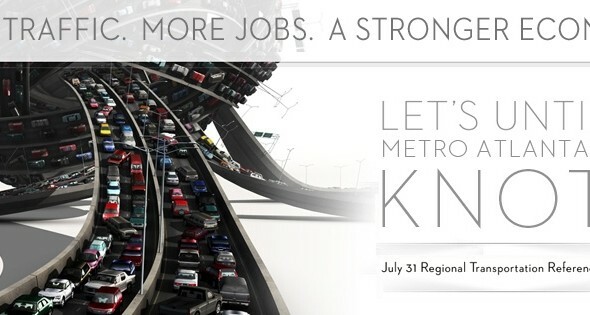 This was the image used by the Metro Atlanta Chamber of Commerce in their campaign for a one-cent regional sales tax hike to support roads and transit in greater Atlanta. Some critics have said the campaign was overly focused on wooing suburban voters. The Georgia Tea Party’s rhetoric about government mistrust seemed to resonate with both urban and rural voters. The AJC interviewed Shirley Tondee, a suburban Republican, who said she thought congestion needed to be addressed, but voted no anyway. “I just don’t trust that government is going to take the money and do what they say they’re going to do,” she said. Nor could referendum supporters fully marshal the support of urban residents and African-Americans, who may have been among the biggest beneficiaries. The DeKalb County NAACP was of the most strident critics of the plan. In a seemingly political move, on the eve of yesterday’s vote, the Georgia NAACP filed a discrimination lawsuit against the Georgia Department of Transportation over a separate matter. Citizens for Progressive Transportation pointed out today, however, that 59 percent of Atlanta city residents approved the measure, calling it a strong endorsement of the transit portion of the plan, especially the Beltline. Some observers speculated that the $8 million spent on the campaign for the transportation tax, which used an image of a tangled highway as its logo, was overly focused on courting suburban voters and took for granted that the measure would receive strong support in urban counties. “The picture [above right] says it all,” said Andrew Austin, of Americans for Transit. Technically, it won’t get worse at any faster rate than it’s been. It just won’t be getting worst at a slower rate nor will it be getting any better. Yet another reason why I won’t be moving back to the ATL. Atlanta is a massive case study in bad planning, making the same mistakes over and over again. This is why I’m a proponent of city-states. Break major cities off from regional and state governments. Make them financially self sufficient. The people who actually live in Atlanta understand the need for better transit. The people in the counties, however, sunk the ship at the expense of the entire region’s mobility and environmental sustainability. Such a shame. When Atlanta boosted its transit for the Olympics, things were looking up. Now, looking dismal. @thisisbossi:disqus yes it will because transit will be cut immediately, at least one service. The more transit that’s cut, the worse it will be. I moved away from Atlanta because I couldn’t stand the traffic and the need to drive everywhere, even to the grocery store across the street which was separated by a wide street with no crosswalks or signals. I was 24 and moved to New York. Even though rent is dirt cheap in Atlanta, the cost of car ownership and the stilting effects of too much traffic made my move away from there a net positive. Now, the real test will be to see what happens in cities noted as competitors to Atlanta – the short-list I see variations on is: Charlotte, Tampa, Dallas, Denver. Charlotte-Mecklenburg County has a dedicated transit sales tax, but like Atlanta, it’s surrounded by suburban counties that seem intent on expanding to the mountains and sand hills. I live in Charlotte, the CITY, and hope that it morphs into something other than Atlanta. Tampa – don’t know much about it. Dallas seems like a heavyweight, with major DART expansion and central U.S. location. Denver’s got FasTracks dedicated funding, but like all sales-tax based systems, it’s fallen short lately (i.e. no commuter rail on NW Corridor). One more interchange isn’t going to help Atlanta. A half century or road construction hasn’t solved their problems. People don’t understand that traffic expands geometrically in a suburban area with no real way to improve the problem since transit doesn’t work there. Nothing but cars running on cheap gas works there, something we’re not going to see again. However Atlanta does have areas well served by transit that can be developed and the stuff that can’t be served will just have to wither as the car dies, which it is already doing very slowly. Big sprawling urban areas like Atlanta will have to learn the hard way. If you want to see a demonstration of the value of transit go check Hotel Rates in Charlotte for hotels on their Lynx transit line vs. hotels the same distance from their city center in the other direction (East or West). Hotels within walking distance of a station are worth twice as much per night. A sad day for those who know and understand the benefits of traffic. I’m sorry, but let the region suffer. Atlanta – the city that coulda, shoulda, woulda been. This was mostly a roads proposal. Just the SR 400 I-285 interchange was estimated to cost 450 million. Most of the projects on the list were roadway systems. We tried a combined roads and transit package in the Sound Transit district, failed. Transit only, passed. MARTA and the counties can do themselves favors in zoning a half mile from MARTA for high-density development. That would get system ridership up. Commuter buses and a better street grid would help too. Gas prices aren’t going to be low forever. When they inevitably rise, communities that have provided non-car transit options will fare much better than those that have their financial fates handcuffed to oil prices. No long-term forethought. A pity, but Atlanta will suffer badly for its decisions. The Democrats (and Republicans) have to start aggressively attacking the Tea Party and stop appeasing their supporters. A party based on mistrust of a federal government belongs in Somalia not the world’s largest democracy. Washington and Jefferson would have had these guys hung for treason. My college roommate and her husband left Marietta, which they loved, to move back north in large part because they found, after a decade there, that her commuting time to work increased fourfold. Atlanta’s problem is that is competing with a whole country of places just like it, but with less traffic because they have not yet grown as large. New York’s problem is there aren’t enough places like it, so everyone wants to live here and no one can afford it anymore. This is simply one thing and it is not racial. It is crime prevention. Suburbs are safe because suburbs have intact families and fathers in the homes. Fact is, single parenthood and divorce are the leading cause of crime and poverty in Amer…ica. Haivng a cheap metro system allows more urban families without fathers to move their kids to “better schools” as if the reason these urban kids are gangsters is the schools fault. Suburbanites know better. They look at the southern suburbs of Atlanta and know what MARTA has done to their communities. They do not want the same for the northern most counties of the metro. Furthermore you can’t just take a train from one area and go to school in another unless you actually LIVE in that area. That’s the whole reason why there is a big debate about high school sports and parents moving to areas so their kids can go to better sports districts. So before you spew your venom and try to disguise it as “not racial,” maybe you should take a look, it’s in a book, buddy. I respect the people who voted No for T-SPLOST way more than people like you who make up lies and try to use them as facts to the uninitiated. They do not want the same for the northern most counties of the metro. Will Atlanta’s Transpo Referendum Overcome Early Voting Deficit?